WHERE DO WE GO FROM HERE? 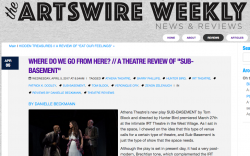 // A THEATRE REVIEW OF "SUB-BASEMENT"
Athena Theatre's new play SUB-BASEMENT by Tom Block and directed by Hunter Bird premiered March 27th at the intimate IRT Theatre in the West Village. As I sat in the space, I chewed on the idea that this type of venue calls for a certain type of theatre, and Sub-Basement is just the type of show that the space needs. Although the play is set in present day, it had a very post-modern, Brechtian tone, which complemented the IRT Theatre with ease. The set, sound design, lighting, costumes, and all technical elements of the production all worked together in tandem to create a palpable and ominous atmosphere. I found myself paying close attention to the set when I was asked to, and then saw it fade into the background as I focused on the story. The looming proscenium implied no particular time or space, allowing the audience to go wherever the characters were leading. The play follows our protagonist Adrienne (an impressive Veronique Ory) through a coming-of-age story where she breaks free from her disturbingly controlling father by traveling to NYC. There she meets two homeless men, the Facebook love of her life named Simon (played by the refreshingly buzzy Patrick K. Dooley), then unbeknownst to her, magically proceeds to get engaged, pregnant, and married. I understood Adrienne's motivation for her journey, but the play lacked the explanation as to why the two homeless characters, Gustav and Arnaud, were helping her. Although quite funny, the plot line of Gustav (played by a seasoned Zenon Zeleniuch) being a "dramaturg" was a bit hazy. During one of his sessions with Adrienne, Gustav states, "I'm a dramaturg, not a psychiatrist," and with a rousing chuckle from the audience, I wondered, was Gustav the dramaturg commenting on the play? Why did he want to help Adrienne? I gleaned that the looming presence of Adrienne's father represented God, especially with the continuous mention of four horsemen riding their way right into NYC to come for her. There were beautifully acted monologues taken directly to the audience by Adrienne and Simon, which depicted their relationship to the "Father" God. And while Adrienne and Simon had their moments with God, I was left wondering, what was God's relationship to Gustav and Arnaud. All four actors brought impressive commitment through some rocky plot points. Luckily, I left the theatre pondering the overarching themes rather than finding fault in plot holes. The play grappled with the question of law versus poetry. Do we give it all up to be creative but broke, homeless and use our own feces for fertilizer? Or do we become lawyers and live with clean toilets, electricity, and in a safe big city? And I myself, was left desiring to know what would happen when the 4 horsemen arrived. Written by Tom Block Directed by Hunter Bird Starring Veronique Ory, Patrick K. Dooley, Zenon Zeleniuch, Barry Phillips .Playing now through Saturday April 15th at IRT Theatre, 154 Christopher St. NYC #3B (third floor) .